To attract more customers and show off your premises, check how Pentagon Digital provides a 360 Google virtual tour for your business; finding your name on Google, the user takes a tour of your restaurant, bar, hotel, and reception area from the comfort of their computer or smart phone. Our certified Google photographer takes images of key areas with a hi-res specialised 3D camera, stitches the panorama together to create a 360˚ seamless walk-through tour. 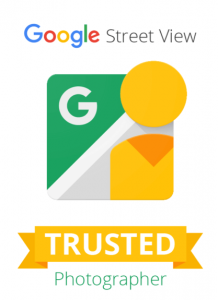 This is uploaded to Google in real-time on your Google profile and map location. The 360 Virtual tour takes priority over all other photos you have. You can use the virtual tour for your website or other social media platforms. • 4 out of 5 people use Google to find local businesses. 59% of customers visit your business within 24 hours. Those who view a listing with a virtual tour are twice as likely to interact with your business. 18% of all local surges lead to a purchase within 24 hours. 81% of consumers go online before deciding where to spend their money.